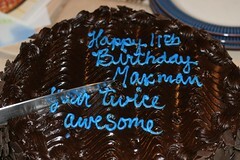 Max is eleven – the years have outpaced his digits and now it’s time for the toes to contribute. Ten fingers and a toe old. It’s cool to see him grow up for sure. Today I showed him how to back our Pathfinder out of the garage – which he was getting ready to clean. So nice to have help with the mundane chores around the house. Of course he’s not even close to the age of driving, but it was fun coaching him. We cruised to the store to pick up a board game (Risk) and another hard drive for our ever expanding library of photos. Tomorrow it’s off to the mountain.